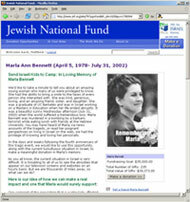 The friends and family of Marla Bennett, a young woman lost in a bombing at Hebrew University during the intifada, built one of our first Tribute pages during the war with Hezbollah and raised over $28,000 for JNF in her memory. Clicking the Find a Tribute button displays a search page that you can use to locate the Tribute Page of someone you know and care about. Clicking the Champion Center button displays the champion center page that you can use through easy-to-use Web content tools, send emails to friends and family asking them to visit the site, and request donations. Tell your story about the Honoree and why you are championing this cause. Upload a digital photo of the person to be featured on the Tribute Page. Provide the street and email address of the Honoree, or a designated Next of Kin contact, that can be notified when gifts are made to the fund. Provide a personal donation as the Initial Gift to the Tribute. After creating the Tribute, you can access the Champion Center to personalize your Tribute Page, send email to your family and friends to ask them to visit your Tribute, and more.